You can choose the type of Yammer feed to include. | Type |Description | Example | |:--------------:|:----------------------|:-------------| |Group |The feed for one group | On a team intranet page.| |Topic|All conversations tagged with one topic| On an benefits page on an intranet, show all conversations tagged with #EmployeeDiscount.| |User|All conversations that include messages from the specified user|On a directory page for the user.| |My Feed|The user's home feed|On a user's My site or home page. For each feed type, you can select options including the size of the box displaying the feed, and whether the background is dark or light. Step 1: Collect the identifying information for the group, topic, or user from Yammer. Step 2: Generate the code to embed using the Yammer Embed configuration tool. Step 3: Embed the code in a Script Editor Web Part on the SharePoint page. You'll need a 400 pixel or wider web part. When the Yammer widget is embedded in a SharePoint page, the specified feed is displayed if the user is signed in. If the user is not signed in, they will be prompted to sign in. How you collect the feed info depends on the feed type you select. Note: This code uses default settings for the embedded Yammer feed. Go to the group in Yammer, and under Access Options at the bottom of the left panel, select Embed this feed in your site. Using Yammer in a web browser, go to the group. Copy the feed ID from the URL. For example, in this URL, https://www.yammer.com/contoso.com/#/threads/inGroup?type=in_group&feedId=1170863, copy 1170863. Using Yammer in a web browser, search for the topic by entering #topic_name in the Search box. For example, if looking for all conversations tagged with the EmployeeVolunteering tag, search for #EmployeeVolunteering. Select the topic, look at the URL, and copy the topic id. For example, in this URL, https://www.yammer.com/contoso.com/topics/2084748#/Threads/AboutTopic?type=about_topic&feedId=2084748, copy 2084748. Using Yammer in a web browser, click the icon or name of the person from anywhere in Yammer. Copy the user ID from the URL. For example, in this URL, https://www.yammer.com/contoso.com/#/users/1906364, copy 1906364. 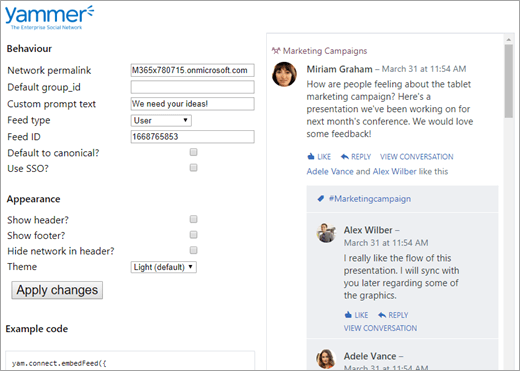 Go to the Yammer Embed configuration tool, at [https://www.yammer.com/widget/configure] (https://go.microsoft.com/fwlink/p/?LinkId=507500). Network permalink: Your domain name for Yammer, such as Contoso.com, or Contoso.onmicrosoft.com. Default group_id: This is only needed for user and topic feeds. It specifies which group should be the default for new posts from the embedded feet. Custom prompt text: The prompt that users will see when a group or My Feed type is selected. If left blank, the default "What are you working on?" prompt will be displayed. Group: The feed for one group. Topic: All conversations tagged with one topic. User: All conversations that include messages from the specified user. Open Graph: Use this to show all conversations about a specific OpenGraph object such as a file or folder or image. It can also be used to embed a Like or Follow button on the page. For information about inserting these buttons, see Embed in the Yammer Developer Center. Feed ID: The ID you identified in Step 2 above for the specific Yammer group, topic, or user. This should be left blank if you select My Feed as the feed type. Default to canonical Only use this option if you have external networks. If a user switches to an external network from a Yammer feed embedded on a SharePoint page, if this option is checked, when the user returns to the SharePoint page, they will start by seeing their home network. If this is unchecked, the user will go directly to the external network. Use SSO: Configure redirection to your identity provider. The domain listed in the Network permalink field must be configured for federation in Office 365. For more information about this option, see Embed in the Yammer Developer Center. Select the Appearance options. The header and footer options only apply to some types of feeds. The preview will show you whether they apply to the feed type you have selected. - Show header: Displays a header on the page. The content of the header depends on the Hide network in header setting. - Show footer: Displays a footer showing the person's name and a log out link. - Hide network in header: If selected, the header includes **Yammer conversations". If not selected, the header shows the company name - Theme : Use a light or dark background for the embedded Yammer conversations. This does not work in all browsers. If you selected an Open Graph feed, select the OpenGraph settings options. OpenGraphURL The URL you want to connect to Yammer. OpenGraph type The type of object: Page, Audio, Department, Document, File, Folder, mage, Person, Place, Project, Team, or Video. Click Apply. You'll see a preview of what will be embedded. Copy the code shown under Example code. On the SharePoint page where you want the code, select Edit Page. Select the spot on the page where you want this information to appear. On the Insert tab, select Embed Code.